As I drew back the curtains that morning, I’ll never forget the sight of the beautiful Croatian islands that appeared on all sides of the ship as we sailed into the port of Dubrovnik. We sat and sipped coffee on the balcony as we marveled at the beauty of the rocky islands with small fir trees – some deserted and some with houses along tiny sandy beaches. Equally impressive was the port with the large bridges as the ship sailed into the narrow inlet outside the old city walls. Dubrovnik was the main city was had come to visit on this trip, because it is the homeland of my mother’s great grandparents who lived there and on the island of Mljet before immigrating to California in the 1850’s. She had always dreamed of visiting, and so this was a very special day for us. It was also extremely beautiful with clear blue skies and a forecast in the high 80’s. Since we were planning on walking the city walls, we paid the $10 per person to take the bus. We were glad we did when we saw how long the walk would have been, but we were surprised at how many people did walk from the ship to the old city. As soon as we exited the bus we were drawn to the stone walls overlooking the ocean. The view was breath-taking with the steep fortified walls rising up high from the crystal clear water. You could see every rock and fish swimming below, and there were people kayaking. After the walk, we stopped in a small café for an iced coffee and then wandered down to the harbor, stopping to look in a few shops along the way. I was actually surprised to see how small the old city of Dubrovnik is – completely pedestrian and you can walk around the whole inside area in less than an hour. It is filled with outdoor cafes, fountains, cobble-stone streets and many shops. My mother had read about the island of Lokrum, so we jumped on a ferry and sailed the 15 minute ride to the island. As we approached I was amazed to see people sunbathing on the large flat boulders that surrounded the shore, as well as jumping off rocks into the shimming blue waves. It seemed like we were approaching one of the islands in Odysseus’s travels and were being lured on shore by the sunbathers. We decided to explore the island first before determining where to have lunch. It is small, tree covered, and filled with strolling peacocks and the sound of cicadas. I felt like I dropped into a fairytale and was on an enchanted isle. There are only two establishments – the first is a small restaurant near the dock area which is charming with tables set amongst the trees overlooking the water. They serve sandwiches and salads. There is also an old stone monastery with a beautiful garden and a restaurant that serves grilled fish on outdoor picnic tables. The rest of the island is filled with chairs to relax in under trees, a salt pond to swim in, and the beautiful rocky shores for sunbathing and swimming. After wandering around, the lure of fresh fish was too much to ignore, so we took a table that had a view of the ocean and enjoyed a lovely lunch of grilled local octopus, green salad, and a glass of the house white wine. It was a dry Muscat with a subdued nose, honey and lemon on the palate, with medium plus acid and length – perfect with the fish. Afterwards we walked to the salt pond and watched kids swing out on a rope over the pond and dive in. Eventually we summoned the courage to go in ourselves and found the water refreshing and very buoyant due to all the salt. Next we decided to try to the ocean so we walked to a place where the rocks formed large terraces near the water and there were ladders attached so you could go in the waves. It was a little bit frightening trying to lower yourself into the water because the waves smashed against the rocks and the tide was high, but eventually I got in for a few minutes and found the water very clean and invigorating. It was more difficult getting out as it was hard to grab the ladder and not get smashed into the rocks. We sunbathed a bit on the warm boulders, and then later walked to the other side of the island near the dock and swam and sunbathed more. After about three hours we caught the ferry back to Dubrovnik and enjoyed the view of sailing into the city from the magical island of Lokrum. They were only charging $1 euro to taste the wine, or make a purchase from the shop. I bought a coffee mug for mom and was allowed to taste two lovely plavac malis. The shop owner was very friendly and provided a nice overview of Croatia’s signature red grape and its history. He explained that the grape we call Zinfandel in California is originally from Croatia where it is related to Plavac Mali. It then migrated to Puglia where the Italians call it Primativo. Rumor suggests it is the Italians who brought it to California during the gold rush where it was planted in the Sierra Foothills and called Zinfandel. Caveat: Even though many Croatians believe that Plavic Mali is the same grape as Zinfandel, Dr. Carole Meredith of UC-Davis proved in 1998 that Plavic Mali is not the same as zinfandel, but is, instead, an offspring of zinfandel. The true Croatian zinfandel grape is called Crljenak Kaštelanski (quite a mouthful!). Dr. Meredith proved through DNA fingerprinting that Crljenak Kaštelanski (sometimes called Kastela Red) is genetically similar to zinfandel. Regardless, I enjoyed listening to the shop owner's explanation. I then told him I was from Sonoma, California, home of some incredible zinfandel. Continuing I told him I had just visited Bari to taste their primativo’s the day before, and so it was exciting to be tasting plavac mali in Croatia -- the real home of zinfandel. The first wine was 2009 Matusko Plavac Mali (69 kuna) with soft velvety tannins, bright berry flavors, medium body, no noticeable oak and quite high alcohol. It was pleasant, but my favorite was the 2006 Potomje Matusko Plavac Mali Dingac with a dark berry nose, spice, intensely concentrated with an elegance you don’t often find on zin, complimented by a very long finish. The owner showed me a map and explained that the Dingac region is known as having the best plavac and is similar to Napa Valley in Croatia wine region fame. He mentioned that Poscip was also a well known region for growing plavac. Next time, I will make sure I can visit these areas and spend more time. I would recommend this shop as a great place to try plavac mali in a friendly relaxed atmosphere. There are many tourist items for sale, and he has a nice selection of wines. Unfortunately cruise ships do not allow you to bring wine on board, so it is only possible to taste on shore. It was interesting to us to see how many people left the ship and immediately went to a local café to have a beer or glass of wine. 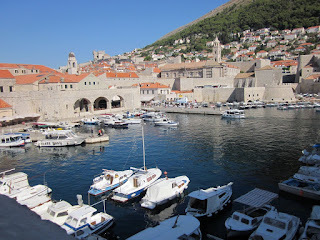 It was difficult to leave Dubrovnik – such a beautiful city by the sea. We stood on our balcony and watched the shore as it faded from sight. The ship then sailed through the islands as the last of the sun was fading and we headed back out into the Adriatic. Good bye Croatia – we will return again! Sept. 2011 – Our ship arrived in the port of Ravenna in the late morning. The day was overcast with a potential for slight drizzle, but the air was warm. We paid to take the bus into the town because it was too far to walk and the docks were in an ugly industrial area. However, once we were dropped off in the city center, we found the pedestrian-only downtown to be delightful. It was filled with old squares, outdoor cafes, fountains, and small streets lined with shops. Ravenna, established in the 400’s, is a UNESCO world heritage site famous for its amazing mosaics which decorate many of its ancient churches and buildings. We made our way immediately to the Basilica of San Vitale and had to wait in a long line to purchase tickets to see the mosaics – but it was worth it. Commissioned by the Emperor Justinian who ruled Ravenna when it was part of the Byzantine Empire in the 700’s – and one of the few bright places during the Middle Ages – the mosaics in the church are a glowing massive work of art. They cover most of the ceilings and walls and are incredibly bright and realistic with scenes of Jesus and other religious stories. A definite must stop place for all who love art and history. After the tour we made our way to a small wine bar and restaurant called La Mariola Casa & Bottega which was recommended by the Ravenna tourist office as a good place to taste local wines, cheeses, and meats. Ravenna, being located in the region of Emilia-Romagna, is one of the few parts of Italy that is not known for any particular wines, but is instead, world famous for Parmesan cheese and prosciuttos. Despite this reputation, we found that the owner of Mariola was very proud of the local wines he offered, and indeed we found them quite delightful. He served us a large plate filled with different cheeses, meats, and the local flat bread called “piadina.” These were all delicious and fun to try, and paired beautifully with the DOCG white wine made from the local Albana grape. It had a lemon citrus/floral nose, and on the palate had a crisp acidity and some minerality. It was unoaked and refreshing. The brand was Zerbina 2010 Albana Secco DOCG at $12 euros per bottle. Mom had the Tremonti Chardonnay Ciardo 2010 with a hint of botrytis. It was full-bodied and off dry ($16 euros per bottle). Probably most interesting was the red wine made from Longanesi Burson, which the owner said was an ancient Italian grape. This was a big complex earthy wine with some oak aging. It was blended with a little sangiovese and graf noir. As it had been open for two days, I found it a little oxidized with some strange carmel notes, but it was pleasant with big, smooth tannins, full-bodied, and dried cherry tones. The brand was Augusto 2003 IGT Ravenna Rosso for $17 euros per bottle. We spent a delightful two hours at the bottega and then visited a few tourist shops in Ravenna before making our way back to the bus and ship. After visiting Ravenna, I swore that when I returned to the States I would buy a mosaic kit and try to make a small patio table top – to commemorate my visit to such an amazing place.